Upgraded Version: Static-free sound, High-sensitivity Infra-Red Learning Function, Deep bass, improved power (Up to 80W). Advanced built-in Subwoofer deliver stereo sound, enhanced volume and rich bass. The stylish and unique appearance will decorate your room more elegant and modern. 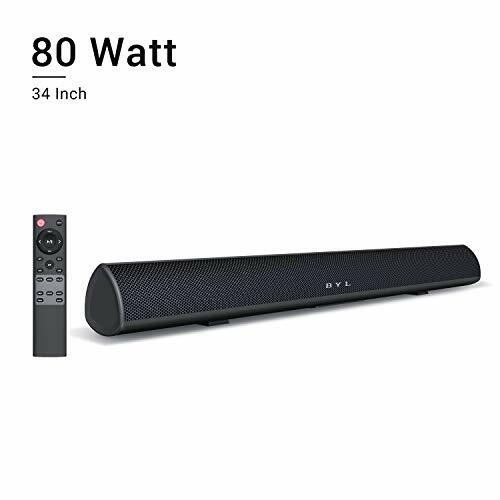 (supports TVs between 32 and 50 inches). Champion Stereo Sound: 2 X Improved Full Range drivers, 2 X Precision acoustic tweeter drivers, 2 X bass reflex tubes bring powerful bass, Utilized anti-noise technology to get more richer and crystal-clear dialog in TV show and movies, enjoy a good balance of dialog and background sound with exceptional clarity and zero distortion. Advanced 4.2 Bluetooth Technology: Connect over Bluetooth in seconds to your any Bluetooth Audio devices. Or play from TVs use the included optical cable. It also supports Coaxial in, Aux in, RCA in, USB.